About a week ago, I received a note from my friend Patty. She is a nurse at Mercy Hospital in Sacramento, CA. She is also the mother of a sweet girl that Julia has been friends with since middle school. Patty told me about the quilts they use at Mercy to comfort dying patients. They ask the family of the patient if they would like to wrap their loved one in a quilt to bring comfort and security as the person goes through the dying process. 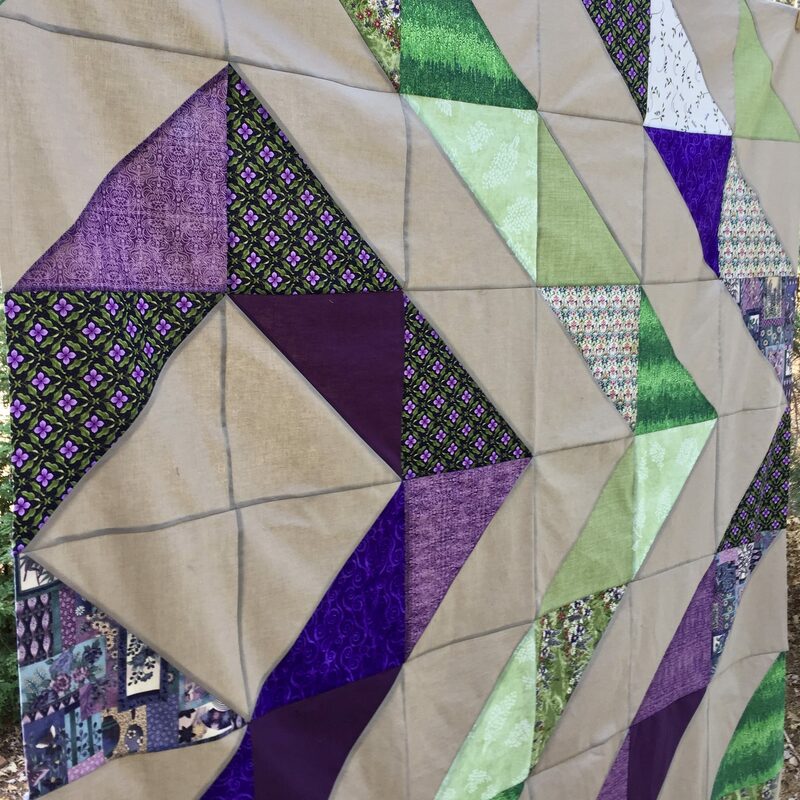 After the person passes away, the family keeps the quilt along with memories of comforting their loved one until the end. Unfortunately the community service group that was providing quilts for Mercy has become unable to do so. She wondered if I might know of quilters who would want to make quilts for the hospital. There are several organizations who do this sort of project; Covered in Love being a very popular one. I have contributed blocks once or twice for CIL and think their work is amazing. Becoming aware of a similar need right in my backyard was eye-opening. In less than a blink of an eye, I replied to Patty telling her I am happy to help as much as I can. Hoping to finish a few quilts quickly, I decided to pull two WIPs and focus on finishing them. I had a box of large 10″ HST’s that I created about two years ago. I had intended to make a twin size quilt with them for the spare bed up in our little house in Downieville. Like so many projects, it was put aside and left unfinished. But I am glad this happened because there were enough blocks to make a comfortable lap-size quilt. 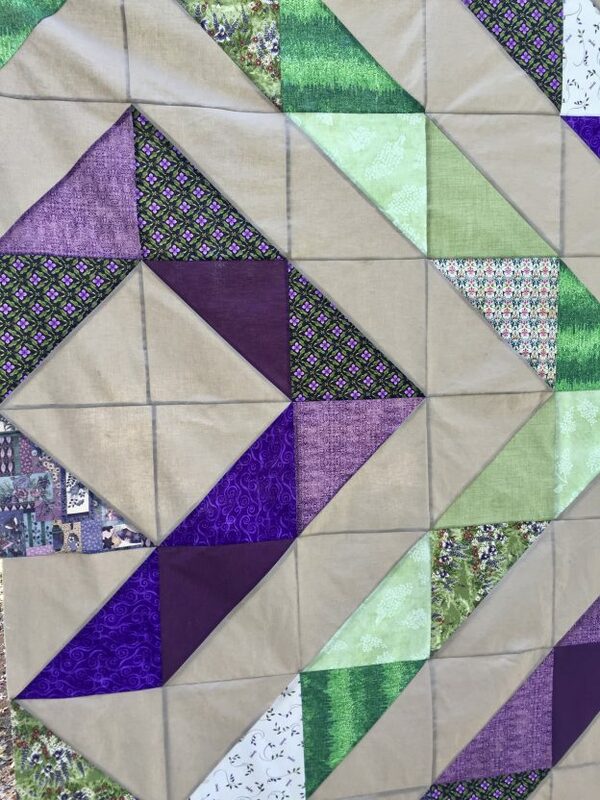 I love the shades of purple, green and tan I used and feel it would be great for both male or female recipients. I played around with the layout several times before deciding on this pattern. Once I made that decision, I spent a quick session squaring up the blocks. They went together in no time and I had a quilt top. It is very motivating to me to make a quilt for a cause that is so near and dear to my heart. Mercy Hospital is renowned for their cardiac care. In 2015 my mother received incredible care at Mercy as she underwent a completely unexpected triple bypass and mitral valve replacement. She was in CCICU for two weeks and my family was (and still is) so very grateful for the care and support she received. Actually we all received care and support as they go the extra mile at Mercy to assure the patient’s family fully understands what is going on with their loved one. We always felt we could ask questions and get help at any time. It is no surprise to me that they have this quilt gifting program. The Merriam-Webster definition of Mercy includes ‘compassionate care of those in distress’. So many of us have provided quilts for compassionate reasons, to help those in need or distress. I want to support this program at Mercy Hospital. Currently I have two quilts in process for them. The other quilt is my Twisted quilt top which is a cheerful floral quilt that looks much like lattice work in a garden. This project was already pin-basted and ready for quilting. Since I was further along with that project, I decided to begin quilting it several days ago. I am making swift progress with that one. I would love to have it finished and bound asap because they are out of quilts at this point in time. Once that is completed, I will baste and quilt this HST quilt. If you feel called to support Mercy Hospital, I would love to hear from you. Do you have a quilt top that is not yet intended for anyone? Might you finish it up and mail it off? I would be happy to bring it to Mercy. California readers, local readers? Would you be able to help out? I plan to mention this at my guild meeting next week to see if there are others who might be able to contribute. If anyone has any ideas with regard to programs like this, please leave a comment. I would really like to gather support for Mercy Hospital and provide them with quilts. 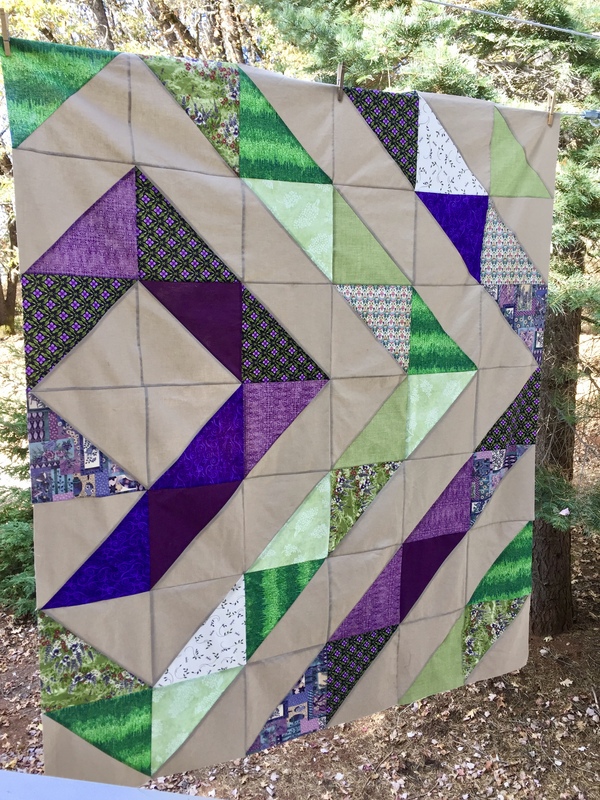 Linking with Crazy Mom Quilts and Confessions of a Fabric Addict! There links are at the top of the page, under Link Ups. This entry was posted in Kindness & Community, Merciful Quilts and tagged hst quilt, mercy hospital in Sacramento ca, mercyful quilts, quilting for compassion on November 2, 2018 by Bernie. Just lap size and themed for adults. They do not serve children or teens at this hospital. I think mine are about 60″ x 70″ or so. Thank you so very much Shirley!! I will email address info to you privately. Bernie, That’s so lovely. How about doing a one-time block drive also, like Kat does? You get such a response from your requests, this may be a good way to help get Mercy started on a pile of quilts. Maybe ask for a nine patch or heart pattern or something easy, your call. However, if you go this route, I’ll gladly pitch in!!! Hi Elana, I am actually considering that. For the immediate need I am asking for finished lap size quilts but going forward, I am working to formulate a plan. Thank you for any support you feel you can provide. I know you keep quite busy with several causes. What a great idea. Good luck finishing your quilts. Thank you Anja. It has been such a long time since I have actually quilted anything so I am really enjoying seeing this one come together. Have a great weekend! You have such a big heart, Bernie. Give me the address and I will send one. And if you are going to organize a drive of some kind, count me in to assemble blocks into quilts. Or anything else you need, of course! Does your guild have a charity program? My guild makes challenge blocks every month and we make them into quilt tops for our charity program. Maybe this is something your guild might be able to help with. I have a completed quilt I can send immediately. Please provide your address. Also, I will help out if you do a block drive. I’ve been contributing blocks to CIL for about a year now. I love doing this because it uses up scrap/stash fabric, it is a nice break from working on large projects and, most of all, it’s for a good cause. Linda! How awesome. Thanks so very much. I will send my address info via email. Your kindness is hugely appreciated!! Are there any particular sizes that the quilts need to be, Bernie? I’m sure I could find a quilt or two to ship to you this week. I am grateful to you for sharing, for quilters with big hearts, and for hospitals as caring as Mercy. Yvonne, Thank you so much!! Any lap size quilt would be wonderful. No specified requirement so I am making mine approx 60” by 70” or so. Depends on the design – I am grateful for your generosity. I will email my address info to you. I’d be happy to send you a quilt or two. Please email your address to me, Bernie. Thanks! I would love to contribute Bernie. I don’t have anything ready, and I’m a rather slow sewer. Can you suggest a quick but lovely pattern for me, and I’ll begin. Thank you for being so kind and generous! Hi Laurie: Thanks so much!! You don’t need to rush – take your time. Here are some thoughts for patterns to peruse. 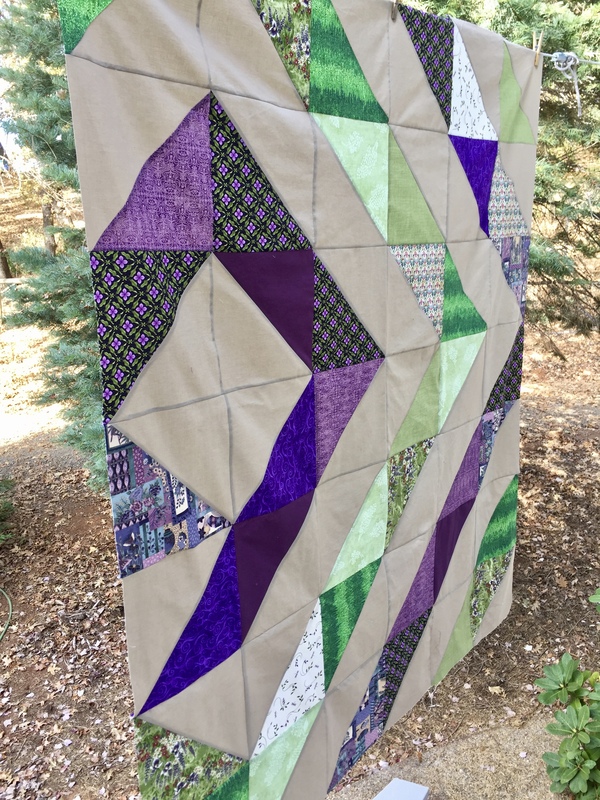 Check out Bonjourquilts.com and see what you think of her Color Explosion quilt or Triangle Twist. I think both of those are very doable. I have made the baby size of Color Explosion. If you made it between the baby and twin size, you’d probably come up with a lovely lap size quilt. Also, QuiltingJetgirl.com has a pattern called Bundle Buster which is great if you have a set of fat quarters you are itching to use up. Finally, On Etsy there is a shop called EricaJackman (Kitchen Table Quilting is her website) and she has two patterns I just love – one is titled Eliza and the other is Betty. Both look really cool and not difficult at all. Let me know if you need more help!! If you agree, I’ll make a big block style quilt. Should the fabric by feminine, masculine, or good for either? Thanks for your advice! Hmm…. I think go with what you like for this one. Gender neutral is always good but if you have fabrics you want to use for either a masculine or feminine look, that is good too. Any of them, all of them – will be loved. I would be honored to send a couple of finished quilts. Just send your address and I will get them out to you. Enjoy you blog! Bernie this is a really beautiful quilt and I hope that a group forms at your guild to help out with the cause, which is so important. Bernie count me in for now as well as for any future drives. It may take me awhile but then again it might not – lol! I love your layout and the purples! Bernie, it’s just like you to step up to the plate when needed! I applaud your efforts. I don’t have anything ready that I can ship at the moment, but will keep this in mind as I filter through my UFO bin, see if there isn’t something I can finish up. I’m getting ready to travel, so it may not be until next month. Thanks Karen – you would do the same thing, I am sure. I would love to receive a quilt from you in a bit – Once you are settled in and have time. Thank you so much!! Happy Sunday!! Trudie – what a kind and generous person you are. Thank you so much!!! I will email you asap with info. No hurry – I have a number of quilts coming in the next week which will be a good start and receiving them afterward that will be just perfect. Have a wonderful Sunday!! Bernie, I would love to participate…..I have one I can bind and send to you this week….just need your information…..Thank you! I am always looking for ways to help others through sewing/quilting. It would be my honor to contribute to such a worthy cause. I have a few projects in progress. My mother-in-law is an avid quilter – – – she does that and everything else that has to do with sewing. She said she would love to contribute to this. I will be seeing her soon and will get whatever she has to send to you. This is a beautiful cause. Oh Bernie, that is so special! Please tell her thank you and when you send her quilt, will you tuck her mailing info in with it? So I can properly thank her. So wonderful! Did you imagine such a big outpouring when you started this post, Bernie? It’s a wonderful cause. Mercy and its patients are very lucky to have you “working” on their team. I’ll get started on a quilt right after festival (this week, yay!) and will let you know when I have a top ready to go. The response is heartwarming Mary. Just so wonderful!! Thanks for your offer and keep in touch with me. I look forward to your donation!! Hi Bernie. I grew up in Sacramento (and now live in New Mexico), and my mother was a Pink Lady at Mercy Hospital when I was in high school. I’ve looked in my stash and found some fabric that I plan to use to make a lap quilt for this project. I probably won’t be able to start working on it until the holidays are over. Take care, Mary. That is wonderful!! Isn’t it a small world? How great it is you are able to support a hospital that is so familiar to you. Thanks so much Mary. Keep me posted and I will get you my mailing info when you are ready. Anytime works for me. I appreciate your note and your generosity!! Both of your quilts are beautiful and I’m sure they will bring comfort to the recipients and their families. This is such a good cause Bernie; when my mum was passing this past May I had my brother bring her 70th birthday quilt (her favourite, liked it more than the one I made for her 80th) to the hospital to have on her bed (she was too warm to have it on her, but it was touching her at least). Several staff commented on what a nice touch that was. It’s so stark and it’s such a painful time to go through for all, so these comforts can mean so very much. Your quilt is radiant! Thank you for spreading kindness and light and love in your corner of the planet. I have a few UFOs that need to be quilted and see the light of day. Would love to have your address so I can get them out to you. That would be wonderful!! I will email you separately – Thanks Katie! I am happy to help I will send at least one.. my nephew is a Resident doctor in Sacramento. I don’t know if he works with Mercy Hospital or where, but I’m glad I can send something for your program and to indirectly honor my nephew, a temporary resident of Sacramento. Hi Carol, That would be wonderful! What sort of medicine is your son practicing? He is new to Sacramento? My daughter-in-law is a resident doctor in Burlington Vermont. These residents work so hard. Thanks so much. Let me know when you need the mailing information! !